← Hugh Jackman Big Bushy Blackbeard! Thomas and Friends in the Scorch Trails! Dinklage in Chains?! Hellooooooooooooooooooo! To all the wonder peeps out there that need all the cwtchs they can get! It is I, Lewis again for another Tuesday round of Interesting Tidbits. I figure I go back to the eighties times, when nobody knew what fashion meant and bright neon colours had intelligence of their own. This time, we’re going to a place where we haven’t got time to bleed. It’s Predator time! 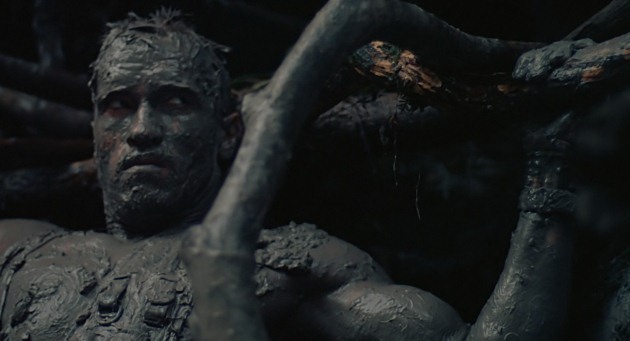 Jean-Claude Van Dammewas originally cast to play the Predator, but he was dropped for being a relentless complainer. *sigh* There’s always one isn’t there. You can’t just have everyone be all happy in what they’re doing. I wonder how he got those Coor Light adverts then if he’s in those cold temperatures in very little clothing? When Arnold Schwarzenegger (Dutch) impales a bad guy against a wooden post with his machete, he quips with “Stick around!” This was improvised on the spot by Arnold. Well he is the King of the One-Liners. 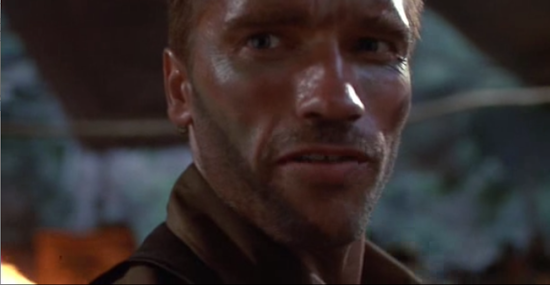 Much as Stallone has his fair share, Schwarzenegger’s entire career is revolved around “I’ll be back”. But very whitty to think of that. Heh, stick. 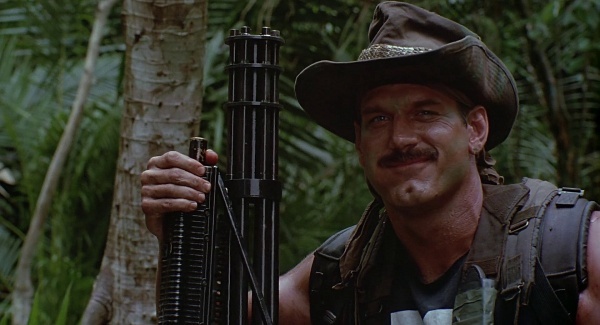 Jesse Ventura (Blain) was delighted to find out from the wardrobe department that his arms were bigger than Schwarzenegger’s. He suggested to his fellow actor that they measure arms, with the winner getting a bottle of champagne. Alas Ventura lost because Schwarzenegger told the wardrobe department to tell Ventura that his arms were bigger. I’m so gonna have to do this on Alan! But will defo have to hit the weights, I look like Toby McGuire pre-spider bite. THAT WOULD BE AN AMAZING FIGHT! But let’s be realistic, E.T. would win hands down. I mean Rocky isn’t mean, he’ll look into those big eyes and crumble, that’s when E.T. will pounce on him with his magic finger. You’re a filthy thing if you thought of something perverted, but I like you because you thought of it and you’re smiling right now. 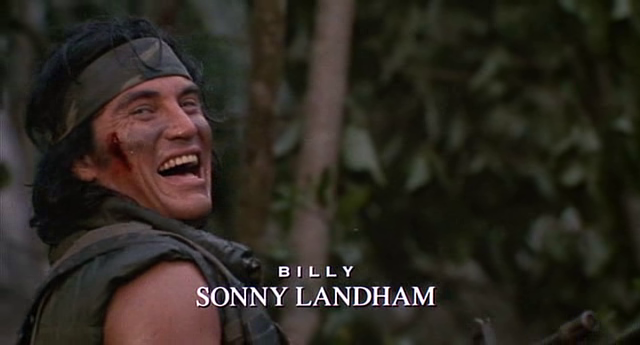 Sonny Landham, who played Billy, was hired to work on the film but only on one condition: the insurance company insisted on round the clock bodyguard for him. Not to protect the actor, but to protect everyone else from hom, as he had a reputation for engaging in fights. Ok, little bit unsettling on this one. Can just imagine the first day when the director introduces the actors together?? 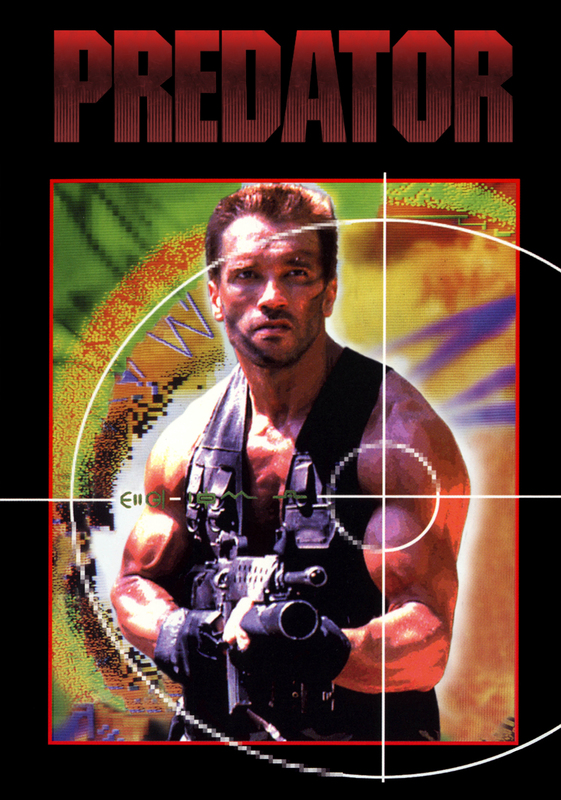 John McTiernan: Ok Arnie, this is Carl who will be playing Dillon, Elpidia on Anna, Bill as Mac, Jesse as Blain, Richard as Poncho, Shane as Hawkins and….Sonny as Billy. Arnold Schwarzenegger: Nice to meet all of you! Who’s that guy next to Sonny. Sonny: LET’S KICK OFF ALREADY! There were countless problems since day one of shooting the scenes in the jungle. The actors had to endure leeches, snakes, high humidity, heat and the rough terrain. The night scenes were filmed during very cold temperatures, which was hard for Arnold Schwarzengger during the latter half when he had to cover himself in potter clay (disguised as mud) and thus made him incredibly cold and wet. Who ever said acting was an easy job clearly didn’t know what they had to go through to deal with all that crap. Lewis does not like the idea of all leeches and snakes and heat! I can’t be in high heat, I’m Welsh! I’d MELT! Kinda understand why JCVD (THAT’S A REALLY GOOD FILM TOO!) left, I mean if I was in a head-to-toe green suit in high humidity with my balls sticking to my thigh like a bear on honey then I’d probably have enough. Is there anything this guy CAN’T think of?! I mean besides an original storyline but we can’t have everything. 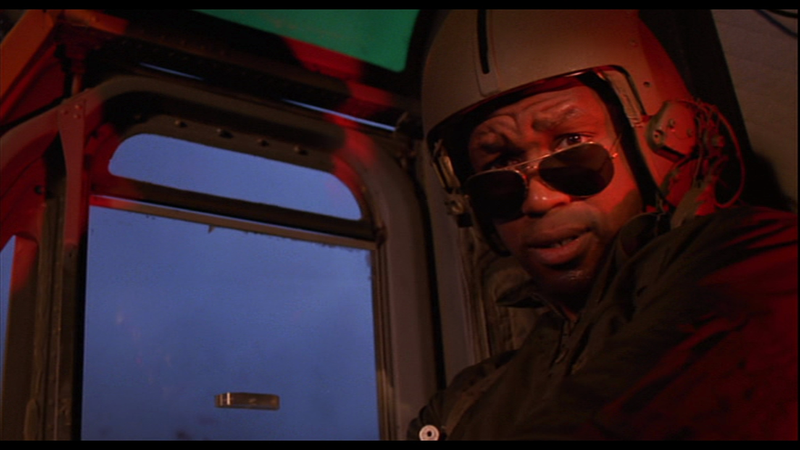 The helicopter pilot seen at the end of the film is Kevin Peter Hall, the actor who plays the Predator. Holy fuzzballs! 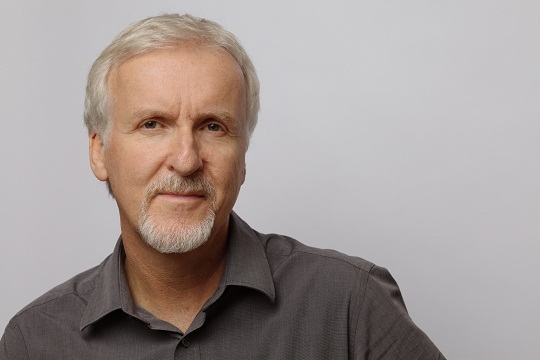 At least he gets his face in the film….somewhat. Bit of a tongue in cheek moment that is. I like that. But looking at his bio and this dude is re-dunk-alicious (Ed: he means ridiculous) tall! This entry was posted in Action, Facts, Sci-Fi, Tidbits and tagged 80s, action, Adventure, Ain't got time to bleed, Arnold Schwarzenegger, Dutch, E.T., facts, films, interesting, James Cameron, Jean-Claude Van Damme, Jesse Ventura, John McTiernan, Kevin Peter Hall, movies, Predator, Rocky, sci-fi, Sonny Landham, Tidbits, trivia. Bookmark the permalink.